In the end I settled for putting all weather tyres on our little second car and in the worst weather I go to work in that one. Since making that decision these wheels have been in our dry garage simply taking up space. For sale are 4 Audi A4 alloy wheels with locking nuts Very good condition. Three of the wheels are very clean the other two have the marks shown. Wheels are ET 47. Center bore is 59mm Tyres are 245/40R18 . LISTED ITEM: 4 X FULL SET OF 17" ALLOYS & TYRES. WILL NEED A FEW TYRES, HENCE THE PRICE. AUDI A4 2000 - 2008. Wesley st, Off Abbey Lane, Leicestershire, LE4 5QG. Howkins Motor Spares (Leicester). Complete with 225/50r17 Continental tyres. 4 17" Genuine Audi A4 Technic alloy wheels. Wheels in good condition see pictures. This is an unused 19" space saver wheel with a Vredestein 175-55-19 tyre. The overall width of the wheel is 180mm. These are ideal on the sports models of the above but due to the large front brakes on RS models, it will potentially need to be used on the rear of the car. The tyres are all stamped AO (Audi Approved). Wheels have been checked and are in very good used condition with only a couple of very minor kerbing grazes on the rim edges as shown in pictures six and seven but certainly nothing of concern. REMOVE FROM AUDI A4 B7 2.0 TFSI CONVERTIBLE,2008 YEAR,200 BHP,6 SPEED MANUAL GVD GEARBOX,ENGINE CODE BWE,PAINT CODE LZ9Y BLACK. MY AIM IS TO MAKE SURE YOU ARE ALWAYS 100% HAPPY! IN WORKING CONDITION AS SHOWN IN THE PICTURES ABOVE. Complete with 205/55r16 Uniroyal tyres. 4 16" Genuine Audi A4 alloy wheels. Wheels have few marks see pictures. 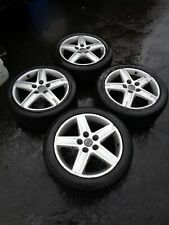 A set of 4 Genuine Audi Alloys and tries. Wheels are in excellent condition. MODEL: A4 B6. MAKE: AUDI. COLOUR: BLACK CODE: LZ9W. GEARBOX: 6 SPEED MANUAL CODE: GDT. BODY TYPE: 2 DOOR CONVERTIBLE. ON THEM IN FORM OF SCRATCHES. THAT IS CORRECT PART FOR YOUR CAR! ALWAYS COMPARE PART NUMBER. PART NUMBER: 8E0601025AK. FOR SALE IS A GENUINEAUDI A4 B6 B7 18" ALLOY WHEEL. SO WE CAN TRY TO RESOLVE BEFORE IT GETS TO THAT POINT. Most electronic components require programming after installation. There are 3 winter tyres and one all weather tyre. There are two Continental tyres (one of which is a winter tyre) and two Pirelli tyres (both winter tyres) although none of the tyres match, they are all different patterns and three of the four tyres are Winter tread patterns. MODEL: A4 B6. MAKE: AUDI. COLOUR: SILVER CODE: LY7W. YEAR: 2002. GEARBOX: 5 SPEED MANUAL CODE: ENW. BODY TYPE: 4 DOOR SALOON. ON THEM IN FORM OF SCRATCHES. THAT IS CORRECT PART FOR YOUR CAR! MODEL :- B8 8K. THIS SALE IS FOR ALL FOUR ALLOY WHEELS AS YOU CAN SEE IN THE PHOTO'S WITH THE PART WORN TYRES FITTED. THESE WERE REMOVED FROM AN AUDI A4 2.0 TDI SE, 2009 MODEL. HERE WE HAVE A SET OF '4' GENUINE AUDI ALLOY WHEELS IN THIS SALE WITH PART WORN TYRE'S FITTED TO THEM. They are all fitted with 245/40/18 tyres. The wheels were removed from a 2015 Audi A4. Audi part number - 8K0601025CB. Motorsound Complex - Glasgow's Alloy wheel specialists. wheel size - 8 x 18. 1 x Orium which is near new with about 8mm tread. OR SALE AUDI RS6 A4, A6, 18" ALLOY WHEELS WITH TYRES. OFFSET: 43. WHEELS ARE SPRAYED, MIGHT NEED REFURBING. RIM WIDTH: 7.5J x 17. AS YOU CAN SEE IN THE PICTURES. Complete with 245/40r18 Pirelli tyres. 4 18" used Genuine Audi A4 S line alloy wheels. Wheels have marks see pictures. Channel Islands. Avoiding later confusion and DISPUTES. Will ask for proof/invoice of work done by specialist in cases of claims. USED PART so do not expect IDEAL AS NEW. I reserve the right to send the parts that are not always in the picture. FOR SALE AUDI RS6 A4, A6, 18" ALLOY WHEELS 8E0601025AC. WHEELS ARE SPRAYED, MIGHT NEED REFURBING. PCD 5 x 112. OFFSET: 43. RIM WIDTH: 7.5J x 17H2. Bridgestone Potenza RE050A 7mm Tread. New Audi A4 B8 8W0 Diamond Cut Audi Sport. GENUINE AUDI A4 B8 S LINE 19" WHEELS. Genuine Wheels & Tyres. Super Wheels. SUPER Wheels and Tyresthe best choiCe. 8,5J X 19 ET 40. PART NUMBER: 8K0601025Q. FOR SALE IS A GENUINE AUDI A4 18" ALLOY WHEEL COMPLETE WITH CENTRE CAP. 18" GENUINE AUDI ALLOY WHEELS AND TYRES. THESE WILL FIT AN AUDI 08 ON A4 ETC. THESE ARE GENUINE AUDI ALLOY WHEELS. INDIVIDUALLY PICTURED ABOVE THESE WHEELS ARE IN GOOD CONDITION WITH. TYRE 1:245X40 18 97Y AVON ZZ5 = 2.75MM OF TREAD REMIANING. GENUINE 2009 - 2016 AUDI A4 A5 A6 Q3 Q5. 1 X ALLOY ONLY. IRELAND, ISLE OF MAN, ISLE OF WIGHT, JERSEY. Complete Running gear. We are much cheaper than the MAIN DEALERS. REFERENCE : CAR. DOES HAVE SCRATCHES MARKS OR AND AGE RELATED WEAR. I ONLY HAVE 1 AVAILABLE. PRICE IS PER WHEEL & TYRE. THE ALLOY WHEEL IS A BBS RD366. CODES ON BACK OF WHEELS. However if we notice that an item has any major issues we will endeavor to point it out. OPENING HOURS FOR COLLECTIONS. 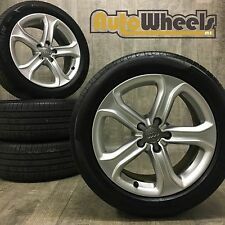 SET 0F 5 GENUINE AUDI 16" ALLOY WHEELS & TYRES. 205 55 R16. AUDI A4 B7 2005-2008. In good working condition. We would be happy to send you more pics to help you decide if this item is right for you. THIS ITEM IS FOR CASH ON COLLECTION ONLY FROM WILLENHALL nr. (Part Number: 205/55/R16 / 8E0601025B. Donor Vehicle: AUDI A4 B7 2005. 9) our warranty covers the cost of the part, and no other costs incurred. example, labour is not covered. cost of hire car is not covered. A NEW TYRE HAS 8MM. FOR SALE IS AGENUINE AUDI A4 B9 17" ALLOY WHEEL COMPLETE WITH TYRE. THE TYRE SIZE IS: 225/50 R17 94Y. THE ALLOY IS IN GOOD CONDITION AS PICTURED. OEM A11OYS. Fully refurbished Genuine Audi A4, A6 S line alloy wheels 18" with good tyres. Tyres size is 245/40/18. - Tyres are 2x Nexen, 2x Boto. Here we have a genuine set of Audi A4 alloy wheels 18". - Audi A6 C7. - They fit Audi A4 B8 model. - Rim width: 8J. - Wheels are straight with no cracks, welds or buckles. 18" GENUINE AUDI ALLOY WHEELS AND TYRES. THESE WILL FIT AN AUDI 08 ON A4 ETC. THESE ARE GENUINE AUDI ALLOY WHEELS. INDIVIDUALLY PICTURED ABOVE THESE WHEELS ARE IN AVERAGE CONDITION WITH. TYRE 1:245X40 18 97Y ACCELERA PHI-R = 7.20MM OF TREAD REMAINING. AUDI A4 B7 (2005-2008). AUDI PART NUMBER: 4F0 601 025 AK. WHEEL HAS BEEN FULLY REFINISHED BOTH INSIDE AND OUT IN SILVER VIA A POWDER COATING PROCESS. THIS WHEEL WILL SUIT. PART NUMBER: 8W0601025R. FOR SALE IS A GENUINE 18" AUDI A4 / S4 ALLOY WHEEL. DOES HAVE A SLIGHT CHIP IN BETWEEN TWO OF THE SPOKES AS PICTURED WHICH WONT AFFECT IT'S USAGE. Audi A4 B8B9 Sline Wheels. Genuine Wheels & Tyres. GENUINE AUDI A4 B8 B9 19" WHEELS. Bridgestone Potenza S001 6.5mm Tread. Super Wheels. 8.5J X 19 ET 40. SUPER Wheels and Tyresthe best choiCe. premium quality. (Taken off a Audi A4 s-line 2007 will fit other Audi models. I have taken as many photos as possible to get the detailing of each wheel. Happy buying :). 5 STUD 8J ET40. 2016 AUDI A4 S LINE B9 2.0 TDI. 18" ALLOY WHEEL. UK MAINLAND ONLY . FOR SALE AUDI A4, A5, A6, A7, A8 19" ALLOY WHEELS. WHEELS MIGHT NEED REFURBING. ONE WHEEL HAS BEEN PROFESSIONALLY WELDED. PCD 5 x 112. OFFSET: 42. RIM WIDTH: 8.5J x 19H2. Good Thread On Tyre, Recently Put On Part Worn Tyre. For sale I have 1x Genuine OEM Audi 19" Alloy Wheel & Tyre. 1 x Black Alloy With Tyre. Could ideally do with a refurb. 18" GENUINE AUDI A4 SLINE ALLOYS & hardly used Pirelli P-ZERO TYRES.